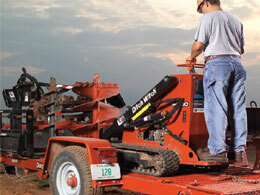 Featuring durable, high-strength axles and full-width wooden or steel decks, Ditch Witch single-axle trailers not only haul the weight—from 3/4 ton to nearly three tons—but they do it in style, with tons of standard features including a complete lighting system. Single-axle design with a full-width wooden or steel deck, tilt-bed or ramps for easy loading and unloading of equipment of up to 5700 lb. Standard tie-down points, tongue safety chains, and complete lighting, including custom-made wiring harness and shock-mounted clearance lights for highway driving.